We want to invite you to see a little of what we are posting on our social networks. Here are our most recent posts. Feel free to follow us on Facebook, Twitter, and other social sites for deals and interesting articles. Air Systems Air Conditioning and Heating is feeling loved. Air Systems Air Conditioning and Heating shared a post. Houston it's Winter again!Temperatures have reached the mid- to upper-30s across the northern reaches of the Houston metro area this morning, offering the region a final, fleeting taste of winter. As of 6:20 a.m. CT, the mark of 39 degrees at Bush Intercontinental Airport ties the record low for today, set in 1989. It is, indeed, quite chilly out with a light northerly wind, so dress accordingly this morning. Enjoy winter's last gasp! The I-45 expansion project between FM 518 to FM 517 in League City/Galveston County will begin a major milestone on Friday, March 1 as crews begin demolition of the FM 646 bridge over the main lanes of I-45. As part of the project, the existing I-45/FM 646 intersection will be converted so that FM 646 will go under the mainlanes of I-45. The intersection will be constructed in two phases. The first phase will include the demolition of the FM 646 overpass, construction of the I-45 northbound mainlane overpass, and reconstruction of the intersection and frontage roads.Beginning on Friday, March 1 at 9 p.m. the FM 646 bridge at I-45 will be permanently closed. In addition, two northbound mainlanes from FM 517 to FM 646 will be closed beginning on Friday, March 1 at 9 p.m. until midnight on Saturday, March 2. 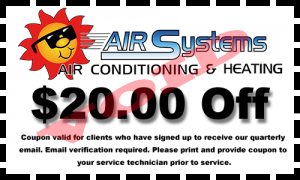 Air Systems Air Conditioning and Heating shared a photo. It's been a busy summer! Looks like the cool weather isn't expected soon.Houston will have another day of somewhat drier weather before a wetter pattern returns to the region through Monday. Yes, another soggy weekend. Sorry about that. Also, while we’re on the subject of bad news, if you’re wondering when fall’s first front might arrive, I’m afraid there just aren’t any really strong signals for that right now. I would not anticipate it coming before around Sept. 20, if then. I am so grateful my friend Lani recommended Air systems . I am a single mom and has been slammed with issues of various things in the house lately . When the AC was not cooling much I called ARS since they installed them to check . They priced a $3000 coil replacement and I was almost in tears . Air Systems is looking for self-motivated and hardworking HVAC Installers to join our team. Candidates must be dependable, demonstrate good work ethic and communication skills. We are a growing Residential and Light Commercial HVAC Company who takes pride in providing the highest level of customer service. We offer competitive pay, employee benefits and an excellent work environment. Take a moment to check out our reviews. If we've serviced your home or buisness, please share your experience! Was your air conditioner damaged due to Hurricane Harvey and in need of replacement? Check out our recent blog with information on rebates available from American Standard.